NASA's Fermi Gamma-ray Space Telescope has found a signal at the center of the neighboring Andromeda galaxy that could indicate the presence of the mysterious dark side of the universes known as dark matter. The signal is similar to one seen by Fermi at the center of our own Milky Way galaxy. Surprisingly, the latest Fermi data shows the gamma rays in Andromeda -- also known as M31 -- are confined to the galaxy's center instead of spread throughout. To explain this unusual distribution, scientists are proposing that the emission may come from several undetermined sources. One of them could be dark matter, an unknown substance that makes up most of the universe. 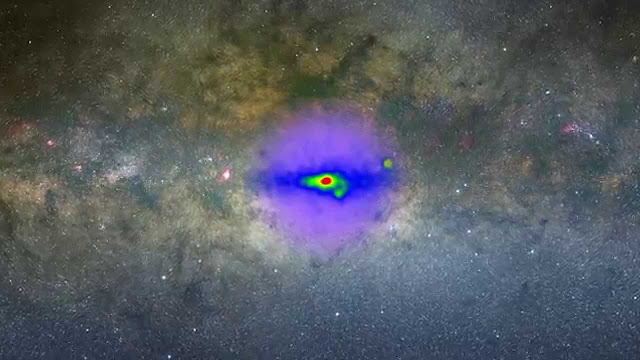 The image of the Milky Way above, shown in visible light, superimposes a gamma-ray map of the galactic center from NASA's Fermi. Raw data transitions to a view with all known sources removed, revealing a gamma-ray excess hinting at the presence of dark matter. The Milky Way's galactic center teems with gamma-ray sources, from interacting binary systems and isolated pulsars to supernova remnants and particles colliding with interstellar gas. It's also where astronomers expect to find the galaxy's highest density of dark matter, which only affects normal matter and radiation through its gravity. Large amounts of dark matter attract normal matter, forming a foundation upon which visible structures, like galaxies, are built. No one knows the true nature of dark matter, but WIMPs, or Weakly Interacting Massive Particles, represent a leading class of candidates. Theorists have envisioned a wide range of WIMP types, some of which may either mutually annihilate or produce an intermediate, quickly decaying particle when they collide. Both of these pathways end with the production of gamma rays -- the most energetic form of light -- at energies within the detection range of Fermi's Large Area Telescope (LAT). When astronomers carefully subtract all known gamma-ray sources from LAT observations of the galactic center, a patch of leftover emission remains. This excess appears most prominent at energies between 1 and 3 billion electron volts (GeV) -- roughly a billion times greater than that of visible light -- and extends outward at least 5,000 light-years from the galactic center. "Dark matter in this mass range can be probed by direct detection and by the Large Hadron Collider (LHC), so if this is dark matter, we're already learning about its interactions from the lack of detection so far," said co-author Tracy Slatyer, a theoretical physicist at MIT in Cambridge, Mass. "This is a very exciting signal, and while the case is not yet closed, in the future we might well look back and say this was where we saw dark matter annihilation for the first time." The researchers caution that it will take multiple sightings – in other astronomical objects, the LHC or in some of the direct-detection experiments now being conducted around the world -- to validate their dark matter interpretation. A Fermi 2015 study was an example of innovative techniques applied to Fermi data by the science community, said Peter Michelson, a professor of physics at Stanford University in California and the LAT principal investigator. "The Fermi LAT Collaboration continues to examine the extraordinarily complex central region of the galaxy, but until this study is complete we can neither confirm nor refute this interesting analysis." Dwarf galaxies orbiting the Milky Way lack other types of gamma-ray emitters and contain large amounts of dark matter for their size – in fact, they're the most dark-matter-dominated sources known. But there's a tradeoff. Because they lie much farther away and contain much less total dark matter than the center of the Milky Way, dwarf galaxies produce a much weaker signal and require many years of observations to establish a secure detection. There's about a one-in-12 chance that what they saw in 2015 in the dwarf galaxies is not even a signal at all, but a fluctuation in the gamma-ray background, explained Elliott Bloom, a member of the LAT Collaboration at the Kavli Institute for Particle Astrophysics and Cosmology, jointly located at the SLAC National Accelerator Laboratory and Stanford University. If it's real, the signal should grow stronger as Fermi acquires additional years of observations and as wide-field astronomical surveys discover new dwarfs. "If we ultimately see a significant signal," he added, "it could be a very strong confirmation of the dark matter signal claimed in the galactic center."